Who knew way back in 1966 that S. Bar-David (aka Shimon Wincelberg), the unsung Star Trek TV writer who came up with the Vulcan Mind Meld, was a visionary? Because here’s the thing: it’s not fiction. It’s fact. Except, you know, for the Vulcan part. And, okay, the part where you have to put your fingertips on the other guy’s face to do it. But hey, the world was pretty much analog back then, so who could blame Wincelberg for seeing life as hands-on, and thus missing the nuances of how information is actually transferred from one brain to another? To figure that part out we had to wait for something that even ‘Bones’ McCoy didn’t have access to — fMRI technology, which revealed that when we’re really engaged in listening to a story, our brain synchronizes with the speaker’s brain – literally mirroring it. In other words, we really are on the same wavelength, and their experiences become ours. With one fascinating exception: when we’re very, very engaged, the listener’s brain leaps ahead of the speaker, anticipating what is going to happen next. The exact same thing is true when we’re reading a story. We become the main character, aka the protagonist. Our brain synchronizes with theirs, allowing us to viscerally experience what they’re going through as they try to solve the story problem. While this is incredibly enjoyable, story’s primary purpose is not to merely entertain us. Rather, story’s evolutionary purpose is to allow us to vicariously navigate unexpected (read: unfamiliar, unknown and so scary) situations from the safety of our own armchair, the better to pick up pointers for surviving them, should they ever befall us on our way to the kitchen for a snack. Exactly! It’s yet more proof of the fact that we don’t come to story for the great prose or for the plot, but for what the plot forces the protagonist to overcome internally in order to solve the story problem. Story is an internal brain-to-brain, emotion-driven expedition, whether it’s a literary novel, a potboiler or an ad for toothpaste. In short, a story is about how the plot affects the protagonist. The good news is that protagonists are people. Just like you and me. They live and breathe and make decisions the same way we do. The bad news is that writers often tend to leave this crucial layer out, giving us only a beautifully written rendition of the story’s external shell – the plot, the surface, the “things that happen” — rather than what’s beneath the surface, where the real meaning lies. With that in mind, let’s take a look at 6 ways we innately navigate reality, and how to make sure that your protagonist does likewise – on the page — so the reader’s brain can experience it. 1. We go into every situation with specific expectations. YOU: When you walk into your office in the morning, whether it’s a corner suite, a teeny tiny cubicle or, like me, a laptop on your kitchen table, you always have expectations. You expect your boss will be pleased with the report you slaved all weekend to finish; you expect your cubicle-mate to reek of that wretched aftershave he mistakenly thinks is a chick magnet; you expect that the dirty dishes you left on your “desk” last night will still be there. YOUR PROTAGONIST: The exact same thing is true of your protagonist. He has expectations for every situation he ventures into. Those expectations are the yardstick by which he then evaluates the meaning of what actually happens. And after all, that’s exactly what stories are about: What we do when our expectations aren’t met. So if you don’t tell us what the protagonist’s specific expectations are, how will we know when those expectations aren’t being met? We won’t. THE TAKEAWAY: Tell us what your protagonist expects to have happen first, so when it all goes kerlooey! we’ll be in on it, instead of standing outside wondering why the hell she’s sobbing, when as far as we can see, nothing bad has happened. 2. We always try to make sense of what’s happening to us. YOU: Let’s say you walk into your office and out of the blue your boss begins grilling you about the last expense account you turned in. You calmly walk him through each item, but your heart is racing –– even though you’ve never overcharged the company for so much as a pencil. You’re madly trying to figure out why he suddenly seems suspicious, what information he’s hunting for, and what the hell is going on. That’s what we do when anything out of the ordinary happens – no matter how small or seemingly inconsequential. We’re constantly trying to figure out what things really mean in order to be sure we’re safe – and, as important, not inadvertently making a fool of ourselves. YOUR PROTAGONIST: Not only is your protagonist trying to figure out the same damn thing, it’s what readers come for. In life we’re always told, “Never let ‘em see you sweat.” Stories are about sweating. We want to know what someone would really think and feel under all that pressure. Being human, we already know, in general, how something like that would feel. We’re looking for specific pointers on how to survive it. In other words, we’re dying for something we don’t know. That’s why your goal isn’t simply to tell us what’s happening from the outside, but to show us how your protagonist is reacting to it on the inside – so we can sweat it right along with her. THE TAKEAWAY: The cause-and-effect trajectory the reader comes for isn’t just external – that is, what happens on the surface. What we’re really hungry for is the internal cause-and-effect, as your protagonist interprets the external situation, and madly figures out what she should do about it, without giving away her hand in the process. 3. We draw on memories to evaluate what’s happening now and what to do next. YOU: It’s been a long day, especially with your boss being so grumpy. You can’t wait to get home, draw a nice hot bath and just soak. You’re about to pull into your driveway when you remember that you were supposed to go to a house warming party across town for your old college roommate. It’s the last thing you want to do. But he was so helpful last year when your car broke down, plus when you were a kid didn’t your mom always tell you that kindness counts most when it costs you something? You can still see her smiling down at you, and it hits you for the first time how exhausted she must have been after work, but she always took you shopping whenever you asked. With a surprisingly contented sigh, you turn around and head crosstown, paying it forward. That’s how we humans roll: to figure out what things mean in the present, we innately sift through prior experience for clues. YOUR PROTAGONIST: That’s why when it comes to your protagonist, snippets of memory are continually called up as she struggles to make sense of what’s happening now. For your readers it’s a twofer. They get to experience the event filtered through her worldview, and they get revealing bits of backstory at the same time. In fact, the best way to give us backstory is as it flies through the protagonist’s mind, while she struggles to figure out what’s really going on, and even more important, what it means. THE TAKEAWAY: What things mean to your protagonist is wholly dependent on, and defined by, what’s happened to him in his life up to that point. So if, um, you don’t know much about your protagonist’s past, how can you know anything about how he sees the world, what he wants, what frightens him, why, or – as we’re discussing here – what specific memories he might call on to make sense of the present? Pantsers, you might want to pause here and consider this for just a sec. 4. We imagine how what we’re doing now will impact us in the future. YOU: It’s time to tackle your dream of being a writer. So you fire up that new laptop, and begin pounding out the great American novel. As you write, you imagine how much your life will change when it’s done. For one thing, your second grade teacher will call you and apologize for saying you’d never live up to your true potential. And your loser ex-boyfriend Phil will realize that he was fool to two-time you, but even if he begs you to take him back, you won’t. You’re just happy that your novel will set the record straight, and let the whole world know what a dweeb he is. You even feel a little sorry for him, ‘cause when the movie version comes out, you’re pretty sure they’ll have gotten that Napoleon Dynamite guy to play him, or even better, Jabba the Hutt. You’ll argue against it, but hey, if the shoe fits. Ah yes, anticipating how what we’re doing now will impact our future can be sweet indeed. And, happily for writers, we’re usually not very good at it. We tend to either be massively overoptimistic, as evidenced above. (If only!) Or, we go all Worst Case Scenario, envisioning the end of everything, except, of course, everlasting humiliation. Read: we need stories to set us straight, and let us know what the possibilities really are. YOUR PROTAGONIST: That’s why your protagonist must always be anticipating how what she’s doing now will impact on her future – for better or for worse. And see how this ties into what we were saying earlier, about the need to let the reader know what your protagonist expects to have happen? Knowing your protagonist’s expectations gives you golden grist for that particular mill. THE TAKEAWAY: The more you know what your protagonist thinks the consequences of her actions will be, the more you’ll know about how, and why, she’ll react when it doesn’t turn out exactly as she planned. Remember: As the brilliant author Kathryn Schulz says in her TED talk On Being Wrong: We think this one thing is going to happen, and something else happens instead. 5. We evaluate everything for meaning; we’re always drawing conclusions. YOU: Your brain is a meaning-seeking machine. It’s a biological imperative: you’re always on the hunt for meaning—not in the metaphysical “What is the true nature of reality?” sense, but in the far more primal, very specific sense of: Max left without his usual morning coffee; I wonder why? Betty is always on time; how come she’s half an hour late? That annoying dog next door barks its head off every afternoon; why is it so quiet today? What common thread runs through all these things? They matter to you, because they affect you. Why do you notice them? Because they’re out of the ordinary. They break a familiar pattern. And, because you know that they’ll have a consequence — one it behooves you to anticipate and to prepare for. On the flipside, things that don’t matter to you? Things that have no consequence in your life? You don’t give ‘em the time of day. You couldn’t. Because you don’t even notice ‘em. YOUR PROTAGONIST: Your protagonist is just like you. She never mentions things that don’t matter to her. She doesn’t narrate objectively. She doesn’t notice things simply because they’re there. She doesn’t reflect on the past just because it happened. Instead, she notices, mentions, and reflects on things for ONE reason, and one reason only: because she’s probing them for information that might come in handy, given what’s happening in the moment. THE TAKEAWAY: Your protagonist must only see, notice, mention or muse on things that have story significance. And when she does, she must then draw a conclusion that has a story consequence. Remember: This is where the “And so?” Test comes in handy. After everything you protagonist does or says, ask yourself, “And so?” What’s her point? Why did she notice that? What conclusion does she draw? What new intel does it give her? How does it move the story forward? 6. We read everyone’s body language to gauge their true intent. YOU: You’re sitting in your favorite booth at the diner with your beloved, and even though he’s smiling as he tells you about the new widget his company is importing, there’s something about the expression in his eyes that has you on high alert. He looks worried. And he keeps reflexively glancing at the door, which seems to upset him, as if he knows the gesture is “giving something away,” but he can’t stop. That’s when you realize that the annoying tap, tap, tapping you’ve been hearing is his knee hitting the table from beneath. He’s jittering, that can’t be good. But just when you’re sure he’s about to confess to murder, or worse, that he’s two-timing you like that jerk Phil, a brass band bursts through the door playing “your song,” he falls to one jittery knee and proposes. Point being, body language evolved as a biological lie detector, as if Mother Nature anticipated how popular actual lying would become once we mastered speech. Yep, body language is the one and only language we aren’t capable of lying in (Meryl Streep notwithstanding). However we’re quite capable of misinterpreting it, as evidenced above. YOUR PROTAGONIST: Your protagonist can be solemnly vowing one thing, while her body language is saying something decidedly different (which is to say, her body language is blabbing the real story, the internal story, the story your reader is most attuned to). It’s this delicious discrepancy that helps build tension as the reader tries to figure out when your protagonist is going to fess up, come clean, face the music, grasp reality – or, even juicier — what will happen if she doesn’t. THE TAKEAWAY: Body language is never neutral; it’s integral to what the scene is really about. It exposes your characters, telegraphing things that they’d much rather keep secret. This is exactly what makes body language so useful to you as a writer – it’s a nifty tool for hinting at the real story, and cluing the reader into the underlying truth. Remember: Don’t use body language to tell us things we already know, use it to tell us things we don’t know. Think of language as text, and body language as the very revealing subtext. Yep, body language is the original snitch! You feel me? First you must create a protagonist who actually has a mind to begin with. Not an “objective” mind, not a mind that does what “any person” would do, and not a mind that evolves as the story unfolds. But the unique mind he goes into the story with. A mind with a fully developed worldview that’s been created, shaped, and honed by the very specific experiences he’s been through up to the moment he ambles in on the first page. Experiences that, no doubt, catapulted him into the story problem he’s now faced with, and experiences he’ll draw on, learn from, and reinterpret in order to solve it. After all, the last thing you want is for your reader to attempt a Vulcan Mind Meld with your protagonist, only to find herself staring into the eternal sunshine of a spotless mind. What methods have you come up with for getting a good look into your protagonist’s mind before you set her loose on the first page? Love this, Lisa. Really insightful. Thanks. All of these are very good pointers. Definitely something I’ll keep firm in mind the next time I’m hitting the keyboard! Thank you for such an insightful article. 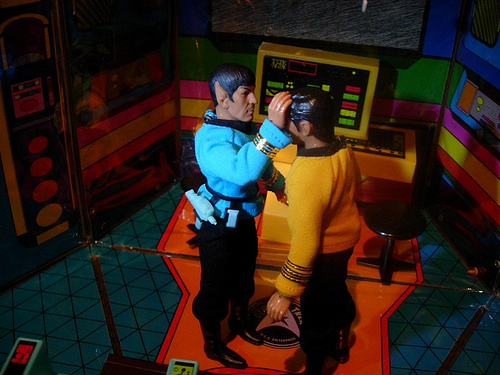 Always loved the Vulcan mind-meld, and I’ve thought books are the perfect time-travel vehicle. Since I’m an inveterate letter-writer, I find it’s easier to get into my characters’ heads while they write letters to each other, or to me. Not only does it capture voice, but relationships, and most-importantly the why … even if they lie. Lisa, Can you do a mind-meld with me as you read my words (sans fingertips to skull, or course)? Good. Now I don’t have to tell you how much I appreciate your generosity in sharing your wisdom here. I love this quote especially – “we don’t come to story for the great prose or for the plot, but for what the plot forces the protagonist to overcome internally in order to solve the story problem.” Just awesome! Too many writers don’t get this, and I’m always disappointed by a story that is all plot and no characterization. Really fascinating points! Great examples! I think I’ll shut off my computer for a week to process what you’ve written. It’s that meaty and important. The immediate application, ask me, is on the level of scenes. Scenes are effective when they: counter expectations, throw curves, in some way echo or amplify back story, have consequences (which lead the story forward), shake the protagonist’s thinking, and reveal sometime new about someone else. Tick, tick, tick, tick, tick, tick. You’ve laid the scientific foundation, now it’s up to every novelist to enact that in every scene. As you know, I am one with you in that the events of a story are the outward framework, whereas the *true* story (the one with meaning for the reader) is the long inner transformation (we call it journey) of the protagonist. Many authors have problems with that, especially if they are genre focused, plot-driven, outline enthusiasts or have a cool temperature style that values objectivity (showing) and eschews emotional exploration (telling). For such writers the inner journey can feel like a brake and artless filler. Generally speaking, I think a blend of “showing” and “telling” (if you know the tricks of “telling”) are the best bet, but whatever techniques you use and wherever you are comfortable, don’t argue with Lisa. She’s got science on her side. Lisa, this is amazing. Thank you. So much to think about and weigh in the upcoming words. Great post! Excellent summary of what we need to remember most as we create our stories. What you have given us is a succinct “real person” (read fully developed) litmus test for our characters. This one is going into the bookmarks! I read this and immediately thought of Donald Maas, then saw he’d already commented. If writers only read and internalized the most recent posts from the two of you, they’d have enough to last them a year. Donald Maass. Who’s Donald Maass Charlie? There’s enough stuff here to fill a book. A very, very good book. But this post is how I love it best – distilled down to the invaluable information. I have saved it. I will use it. And my story will be much better for it. Thanks so much, Lisa, for sharing your wonderful insights. Until I think about this for a long time all I can say is, “You said it all.” Every point was excellent. No filler. What Donald Maass said, times two. Plus a couple “oh my gawds.” for the profound insights I got while reading. Can’t wait to apply this to my own writing today. Thanks! To boldly go where no writer has gone before – (Ahh, ahhhhhh, ah ah ah ah ahhhhhhh) Yeah, that’s the written version of the Star Trek theme song. STAR TREK II The Wrath of CRON. School is in session. There must be a test on this post. The Wrath of Cron! That’s priceless, BB. Amazing post, Lisa. Always so much to learn…. My younger sisters are identical twins and have been mind-melded since birth, this concept is something that I am very familiar… but I’ve never looked at it as a character development tool. It’s so obvious, it’s brilliant! I love this, these considerations are exactly what I need to do in a few weak places in my WIP. You’ve saved me from countless hours of ruminating solitaire. Lisa, this is exactly what I teach in my fiction writing classes, but you’ve said it better than I ever have. Excellent post I’ll be pointing my students to! Definitely. Sometimes we know we have to get the characters from point A to point B. There’s a clear cut way to make that happen, maybe, but it’s always more interesting to give it over to the characters and see how they’re going to make it happen. Always. This is something I need to think more about in future works; I think I can improve here. I’m sure this post took a lot of time to compose, but it is a true gem. Thank you! Thank you, Lisa! I used to worry that my writing was too “internal” and focused too much on what my protagonist thought about everything that happened to her. It’s extremely validating to read that *that* is what helps readers connect to the characters. EMMY NOMINATIONS ANNOUNCEMENT GOES TO LISA CRON FOR 6 Ways to Make Your Reader’s Brain Syncs with Your Protagonist’s Brain. I’ve read whatever I could on how to get my protagonist’s backstory into the foreground. For the past two months I’ve taken my completed first person manuscript and began talking third person. YES! Now, maybe, just maybe, my protagonist can be in the present and talk about her journey. As always with you, stuff to stew on. Thanks. Thank you, Lisa! This is such helpful timing, as I am preparing for a new round of revision on my WIP. I already knew my main characters needed to be “more” on the page, but it feels as though you just handed me a road map. I know I’ve got a lot of revising/rewriting ahead, but I’ll be digesting and revisiting this post as I work. Thank you, Lisa, for this. I have struggled a lot trying to figure out how to balance internal/external without really understanding what I was doing or knowing if I was on the right track. Having you so succinctly state how and why is a huge help. I love “aha!” moments! One way I have found useful is to free write or use stream of consciousness, as my character, to really get at what she wants and how she really feels. (It works best when the issue or problem is specific, rather than global.) It’s similar to the improve techniques actors use when rehearsing to get “into” their characters, only it’s done on paper instead of on stage. It may have nothing directly to do with the plot and likely never ends up in the story (at least, not as first written), but this technique goes a long way in clarifying and deepening what that character really wants, needs, expects, believes, and so on. When it works, I end up with all kinds of insights into both character and plot that I never would have imagined otherwise. It’s a part of the writing process that I really love. for me, many of your points are reminders i need fairly frequently, ie, what are the characters’ pasts that influence then now? how you show internal thoughts and feelings? how does all that fit into the story’s focus at hand? Thanks for a wonderful post. Love the ideas you presented, seeing the science behind the art on a matter I ponder a great deal. This was a fantastic article! One of the best reads in all of the years I’ve been learning about becoming a writer. I wish more people would give examples with their explanation instead of just explaining things and try to guess what the writer is trying to convey. I will be adding this article to my personal collection of material! Thank you, Lisa. All I can say right now is thank you!!! Lisa — This article really changed the way I think about crafting a story! I used to write simulations in my former life (as an anesthesiologist) so that the residents could practice life-threatening scenarios from the safety of the simulation lab. As authors, we do the same thing for our readers. Keith Oately’s work on story as simulation is not only fascinating, but potentially mportant science. As well as offering some superb tips on how to write well, this article should convince us to keep doing what we’re doing: The world needs us to imagine and solve problems for it, so readers can indulge in solving them from the comfort of their couches or beach chairs. The world will always need us and our imaginations. The more people practice solving problems by reading great books, the better prepared they will be for real life (or so this line of research could lead an optimist like myself to believe). That is one of the most practical and insightful things I have EVER read on the internal arc of a scene, arc of a story. Thank you for taking time to write that out for us. I would love to read more about fMRI technology and what they have learned from it regarding how people’s brains work while listening. Can I bother you for a link? I have been following the latest neuroscience on how meditation affects brain activity, but I had not seen this info. Very exciting! hopefully, folks can post some more links? Thanks for the links, Felipe. Double-Wow. I’m reading this as much as I can – simply the best article I’ve read for ages. My neuro training (nurse/counsellor/brain injury) definitely tells me you are making great good sense. Now if my writing could only use more of this! Thank you so much! (and the comments are great too). That’s a great quote. I would add that it unfortunately only rarely causes the entire system to reboot. I was going to say, wow, great info here – and very similar to an excellent book I read over and over while re-working a novel last summer. Then I looked to see the post author – and realized that the great book – Wired for Story – was written by her too. Thanks Lisa, you changed my writer’s brain. I am ever grateful. Great post! I find it helps a lot to talk to my protagonists. I usually do it in my journal before I begin a writing day, or when I get stuck. Now I know why! Thanks! I am sharing this all over da place! Best post on writing I’ve read in a very long time. I always tell fledgling writers they must put their characters through therapy — why did they do that? what on earth were they thinking? — and you have outlined the tools and techniques to share their inner turmoil BRILLIANTLY. And reminded us why it’s so important, so human. Lisa, great twist on getting inside your character’s heads to write with full dimension! We need to think like a 3-D human to write fiction well. I’ve taken workshops on subtext and it can be a complex craft to grasp and wind into your own writing. I especially love what you wrote here, as it simplifies it and we “get it”: Think of language as text, and body language as the very revealing subtext. Lisa I am so far behind on my bolt reading, but just wanted to add my thanks for this extremely useful post. The mindless protagonist is an unwitting (ha!) problem with many novelists on their initial learning curve. They mistakenly believe that “point of view” means “what my protagonist sees,” then they take it down as if watching a movie. That’s like picking out “Twinkle Twinkle Little Star” on a piano rather than orchestrating Mozart’s Twelve Variations on the theme. Effective literature is so much more than a melody.